David Glowacki's diverse work in atmospheric chemistry modelling, energy transfer in chemical reaction kinetics/dynamics and a new virtual reality simulator to teach chemistry have two things in common: high impact and benefits for society, and research excellence in computational chemistry. David Glowacki's interest in computational chemistry arose through research aiming to understand the chemistry of atmospheric pollutant molecules, in order to refine air quality models used to set legislative environmental policies. Discovering his raison d'etre in this discipline, he has since used the increasingly powerful tools of molecular modelling in many ways: to understand the fundamentals of energy transfer dynamics, to elucidate the mechanisms that drive chemical reactions occurring in liquids, and more recently developing the Nano Simbox, an interactive software framework which fuses molecular simulation with high performance computing and emerging virtual reality technologies. This allows people to go inside and manipulate real-time molecular dynamics using hand gestures, and has led to a spin-out company that has attracted investment from a range of external sources (e.g., Innovate UK), owing to its potential as a transformative teaching tool to learn about molecular science. David Glowacki graduated from his Chemistry degree at the University of Pennsylvania in 2003, an MA in Cultural Theory at the School of Religions and Theology in Manchester and his PhD in Physical Chemistry at Leeds University in 2008. David was awarded a Royal Society Research Fellowship and tenured faculty position in 2013. From 2013 - 2015, he spent two years as a visiting academic at Stanford University (hosted by Todd Martinez), joint between the Department of Chemistry the Stanford Linear Accelerator. David was awarded the RSC Harrison-Meldola Memorial Prize in 2014 for his theoretical work on energy transfer processes in chemical reaction dynamics. He has published across a range of subjects including classical and quantum dynamics, biochemistry, computer programming, atmospheric chemistry, scientific instrument development, optics, spectroscopy, religion and power, and cultural theory. One of David's cross-disciplinary projects is the multi-award winning `danceroom Spectroscopy', which has been touring internationally over the past few years (e.g., London's Barbican, Germany's ZKM, the London 2012 Olypmics, and the Stanford University Art Institute). Dr David Glowacki is a Royal Society Research Fellow in theoretical chemistry, working in several important fields where computational chemistry is applied. These include understanding non-equilibrium phenomena and energy transfer in chemical kinetics and dynamics in liquids, solids, and biomolecules. Dr Glowacki's research into computational atmospheric chemistry achieved results that are being applied in air quality models used by the DECC (Department of Energy & Climate Change). NSCCS provided Dr Glowacki with the skill set required to understand computational results and methods, ultimately making these models more accurate, so that the government policies which they inform are based on the most accurate data. Inspired by the power of computer modelling demonstrated by NSCCS, Glowacki switched his primary field of research from experimental atmospheric chemistry to computational chemistry (CompChem). Deeper research into CompChem led to his work on simulating complex molecular systems, for which he was awarded the Harrison-Meldola Memorial Prize in 2014 by the Royal Society of Chemistry. He maintains that the ability to simulate complex molecules to the degree of accuracy required by both air quality models and his other key research applications is a massive benefit of the NSCCS service. Without NSCCS guidance, many researchers "would otherwise need a PhD in computational chemistry to make sense of the range of methods available in molecular simulation". NSCCS saves non-specialists huge amounts of time, and ultimately improves the quality of computational data they generate and their understanding during the course of their research. One of Glowacki's latest projects is the Nano Simbox interactive molecular dynamics platform, whose international deployment is managed by a start-up company, Interactive Scientific. 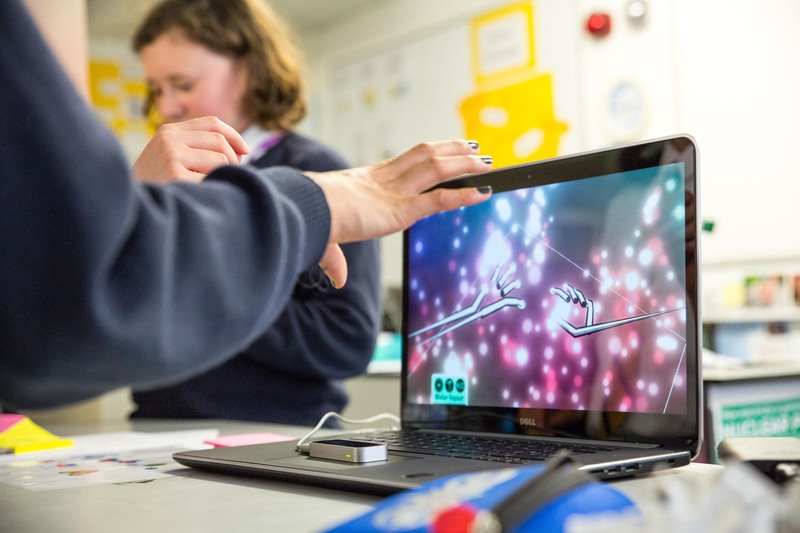 This novel virtual reality demonstrator tours schools, art galleries and science institutions to show the public & school children how different molecules are formed and how they interact. Nearly 200,000 people across three continents have been exposed to the Nano Simbox. The Nano Simbox is being developed into a robust cross-platform product for potential use by researchers in chemical industries, allowing them to manipulate simulations in real-time, and undertake research tasks like drug discovery or chemical process optimisation. As well as numerous chemistry prizes, Glowacki has become a renowned digital artist in the 'science in art' community. He attributes his success in chemistry simulation and digital art to the excellent introduction and guidance in CompChem he received from the NSCCS. "I would attribute my whole interest in computational chemistry to the guidance and expertise that I received while using this service. My hope is that the NSCCS will carry on doing this for other scientists in the future. It's particularly important because of the big trend within chemistry specifically - and science more generally - toward numerical and computational experiments." David Glowacki is a young rising star in theoretical chemistry and physics, and a passionate evangelist of the research benefits that arise through synergistic fusion of both experimental and computational approaches. His principle research field is now computational chemistry, the in silico digitisation of experimentation - which is key to reducing the cost of scientific discovery, interpreting experimental results, and accelerating research progress. In 2014, Glowacki was awarded the Royal Society of Chemistry's Harrison-Meldola Memorial Prize for his theoretical work on energy transfer processes in chemical reaction dynamics. Accurately modelling these reactions on a computer not only saves expensive resources and time, it also furnishes valuable microscopic insights that would be extremely difficult to obtain experimentally. Computational and theoretical experiments also permit the investigation of a larger range of chemical reactions than is possible in the lab. "For any given structure, an architect will have many designs. Rather than building every single one to check which is the best, it's much cheaper to model them on the computer. Checking their structural integrity and load bearing is much cheaper this way. It's a similar idea at the atomic level," he says. Among other accolades, Glowacki is the creator of danceroom spectroscopy (dS), a multi-award winning software/hardware platform that combines semi-classical molecular dynamics with high performance computing to facilitate an interactive molecular dynamics experience, which has introduce the subtle beauty of the dynamic atomic and molecular world to hundreds of thousands of people around the globe. The dS engine was subsequently developed into the Nano Simbox, a platform that mixes virtual reality and high-performance computing to allow non-specialist users to play with complex molecules and thereby learn about molecular interactions and their associated dynamics. 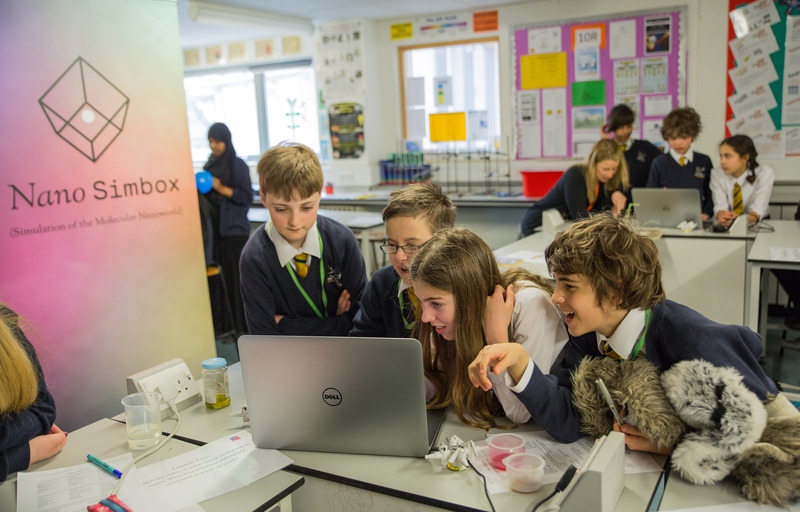 The Nano Simbox is managed by a spin-out company, Interactive Scientific, which is presently developing a commercial product with two principle aims: (1) as a next-generation digital platform for teaching chemistry and scientific simulation in schools, and (2) as an interactive simulation tool to help companies design new molecules, potentially saving them hundreds of thousands of dollars in physical experiments. Both dS and the Simbox have won him fame in the digital art and computational aesthetics community. Alongside these projects, Glowacki continues to research several fields that require CompChem, including understanding the atmospheric chemistry that goes into pollution models of the sort used to set government environmental policy. "A very important method for determining the concentration of pollutants in the urban atmosphere is modelling the chemical reactions that we know happen there," he says. "In science everything is coupled. Just because you understand one part it doesn't mean that reaction happens in isolation - it can have knock-on effects that affect the whole interconnected system, producing results you may not have anticipated." Glowacki foresees that the continued rise of CompChem may one day make some laboratory experimentation redundant, as has been the case in fields like fluid dynamics, where many experimental approaches are now obsolete. "Computational hardware, graphics displays, and our understanding of molecular physics are advanced to the stage that we can start making progress in this direction now." Glowacki has become a digital chemistry evangelist and he attributes his interest and success to NSCCS training - see below. Following his PhD at the University of Leeds in 2008, where he harnessed experimental and theoretical approaches to understand chemical kinetics and dynamics relevant to Earth's atmosphere, David Glowacki converted to computational chemistry as a specialism. The NSCCS provided him with the skills required to carry out accurate computational molecular studies, that ultimately led to more accurate interpretation of his experimental atmospheric chemistry data. In fact it was his exposure to the expertise available through the NSCCS that showed him the power of digital and computational chemistry techniques, and their invaluable role as a complement to experiment. "By all metrics, since having gone into the computational domain I have flourished," he says. CompChem has developed so that non-specialist scientists can use it. Some of the software is now user-friendly enough such that "any amateur can create a molecule in this simulated world - but you need to be a scientist to know what the numbers mean," says Glowacki. This is where the NSCCS (co-directed by Michael Bearpark at Imperial College London) is so important: "It equips non-specialists, those without PhDs and post-docs in CompChem, with an amazing ability to be able to understand and interpret the numbers that come out of the software", he adds. "It is an extremely important service for the broader scientific community so that researchers don't spend lots of time befuddled by ridiculous results, because sometimes the numbers can be absurd if the physics isn't quite right. To know that is extremely useful and it guides your enquiry by giving you the tools to interpret the incredible potential of all the software that is available." The NSCCS software and training gave Glowacki the tools to, in effect, understand a range of molecular systems better. "NSCCS helped me to take the results I had from experiments and interpret them in a more quantitative way, design further experiments and then feed the results into the sorts of models that are used by government to make legislation related to urban air quality across Europe including the UK," he says. Immersing himself in CompChem has persuaded Glowacki that - in many cases - it has the ability to provide researchers with data and microscopic insight beyond what is possible with experiments alone. "For something like an atmospheric model, its accuracy is only as good as the chemistry and physics that goes in to it," he says. "The NSCCS gives researchers the skills required to fine-tune the accuracy of data which is inaccessible using experiment alone. Inevitably there are many pieces of molecular physical chemistry that go into a large atmospheric model, and it's not possible to get all the requisite pieces through experiments." The molecular science that goes into an atmospheric model is collaborative, and more accurate modelling by one party ultimately benefits everyone. "The NSCCS service allowed me to take the reactions I was studying and improve the fundamental understanding and accuracy of the little bits that I am personally contributing to the larger model - I am not the only person doing this, there are large international scientific communities building these models, and computation is becoming an increasingly important part of the model-building workflow." All the areas that David Glowacki works in involve computational chemistry. Some of this work is helping the UK government to understand air quality, some is helping to better understand energy transfer in chemical processes, and some is helping young people to engage with science. But chemical computations are far more than a personal obsession. "Currently we're tackling some of the most important molecules in the atmosphere which are very poorly understood, including isoprene, which is emitted in large volumes over forests. It is the second most common volatile organic species in the atmosphere after methane." In Glowacki's opinion, the top countries in CompChem include the US, the UK, Germany and Japan. He says a facility such as NSCCS is critical in maintaining the UK's leading role in a fast-growing domain of science. "I would attribute my whole interest in computational chemistry to the guidance and expertise that I received while using this service," he says. "My hope is that the NSCCS will carry on doing this for other scientists in the future. It's particularly important because of the big trend within chemistry specifically - and science more generally - toward numerical and computational experiments." CompChem is amongst the fastest growing areas of chemistry. The 2013 Nobel Prize in Chemistry was given to three computational chemists, for the development of multiscale models for complex chemical systems. Glowacki believes that this is a field that is only going to become more important. Dr David Glowacki, Royal Society Research Fellow in theoretical chemistry at the University of Bristol. Also holds appointments as a proleptic lecturer at the University of Bristol and as a visiting scholar at Stanford University.